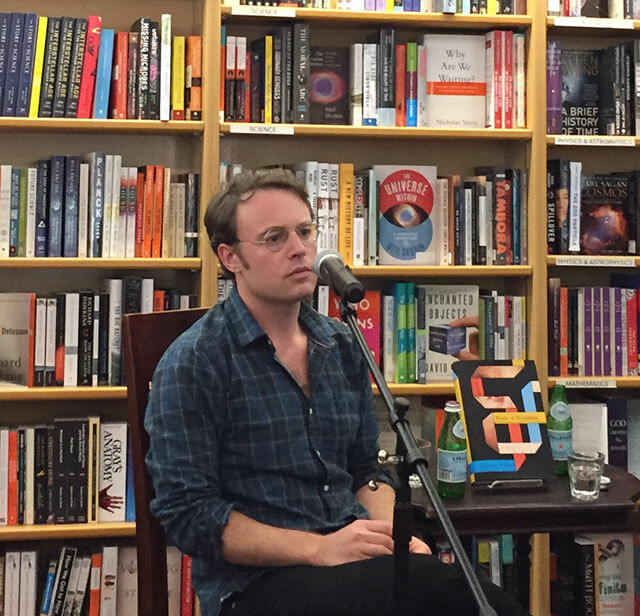 Joshua Cohen’s latest novel, Book of Numbers, follows a technocrat billionaire ghostwriting an autobiography with Joshua Cohen. Joshua Cohen is a character, not the author. Cohen cleared this up at McNally Jackson Books. 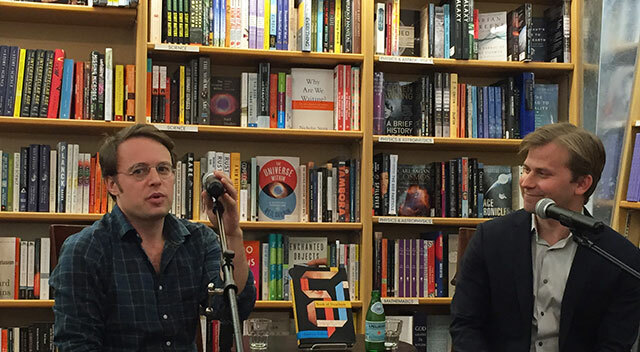 He was joined by his editor Sam Nicholson to discuss the new novel. 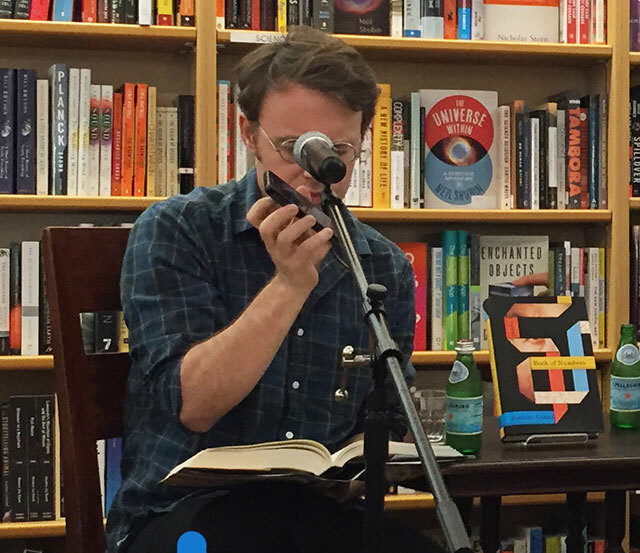 Cohen read from a portion of the novel that included the character Joshua Cohen’s manuscript of the autobiography. The novel explores perceptions and manipulations of the degrees of truth, and one way Cohen looks at this is by showing edits to the manuscript. The result is text that is struck through. In reading this portion, Cohen had pre-recorded the the text that was struck, and interrupted his live reading to play the recording to simulate the missing text. The novel is ultimately an attempt to figure out the point of writing, Cohen says. Now is a time when many people are reading and writing more than ever, yet it is not necessarily substantive. Book of Numbers is about exploring the materiality of writing. Cohen says he felt it was no longer possible to write a book examining the “picked over bones of postmodernism” with the personality of the writer and the writer’s intrusion of the story as a central element. “No one was going to send VH1 Behind the Music to my house,” he jokes. Book of Numbers wants to go deeper into understanding writing. For Cohen, the problem is the way fiction is discussed. “The history of fiction is generally blinkered by the way it’s taught,” he says. Cohen also takes issue with the way literature is talked about by book reviews. Instead of discussing the content of book, what is most talked about is the business of publishing. The intersection of literature and business are at the heart of the novel’s genesis. While teaching at the University of Kansas, Cohen was taking a lot of planes there and back. Many of the people on these flights with him were clearly college educated and better dressed. He would look at the books they were were reading and realized they all read the biographies of business and technology people. His conclusion was that in the same way he will read fiction that he aspires to, these people were reading biographies in an aspirational way within the limits of their world. Book of Numbers is an attempt to bridge these two kinds of aspirations. Cohen says he always intended to write a double story. He was trying to find a way to do that. In the 21st century, everyone is leading this double life on the internet. There is a curated life that everyone sees, and the actual lives people lead. In part this expressed by the edited biography manuscript within the novel. “Fiction to my mind is always what you don’t want, but you need,” he says. He adds that the idea is that we all need what we’re not looking for. Nicholson points out that in Book of Numbers, the internet is functioning in a way that is like religion. The internet offers two functions, according to Cohen. There is the practical aspect of it, allowing users to keep life operating smoothly. But there is also the confidentiality of it. The internet offers the wisdom of crowds for topics that are too sensitive to even discuss with friends. The novel still represents the product of a single person’s view of the world, Cohen says. It might be edited, but it is still fundamentally the result of one person. Its not crowd sourced. That is the value of the novel in an age of the internet. The novel is more or less an unfiltered point of view. The history of literature is really the history of products created consciously by authors and then disseminated. The internet though has created this world where things leak into the public consumption. That makes consumers addicted to the new. The internet though also means presenting a certain kind of identity. Contemporary culture, Cohen says, is about curating an identity. It is about crafting a perception online. It creates “absolutely obsessive crazy” behavior, especially since anyone can intrude into a personal narrative. The idea is that people are constantly vulnerable to the truth. The truth can undermine the identity that has been so carefully curated. These dualities of identity create a crisis. There was a time when everyone on the internet had fake screen names. Now though almost everyone can be identified on the internet. “We might have a second, non-girlfriend Gmail address,” he jokes, but says that mostly people are not wholly dissociated from their online identity. Yet, people are still shocked when they feel physical repercussions of those identities. Fiction is essential in modernity. It helps explain the world, particularly as it grows ever more complex. “Nonfiction, no matter how well written, essentially exists on a single plane,” he says. Fiction on the other hand suggests multiple truths can exist simultaneously.